I totally fell in LOVE with silicone molds too, because I finally had a chance to use my new set. What a difference those make!! 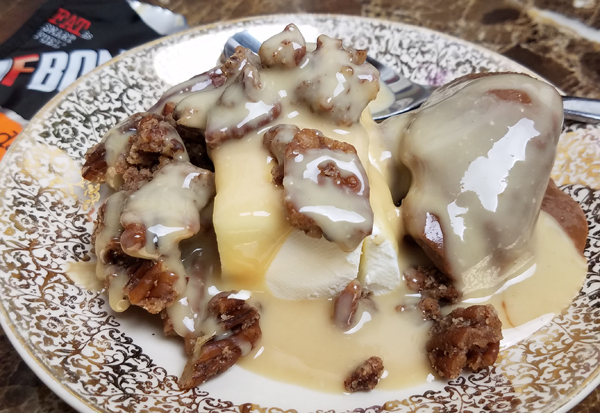 First though, a quick photo tour of my keto food diary for yesterday – so you can see what I ate and how I logged it, for ideas and inspiration. 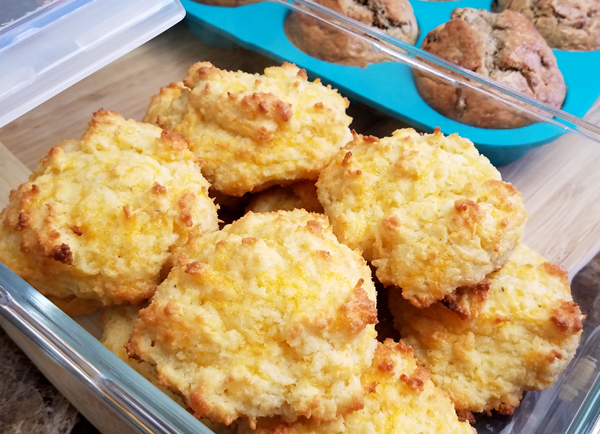 I made the Keto Drop Biscuits recipe again from the Southern Keto Cookbook by Natasha Newton (there’s a picture of us together at that link). 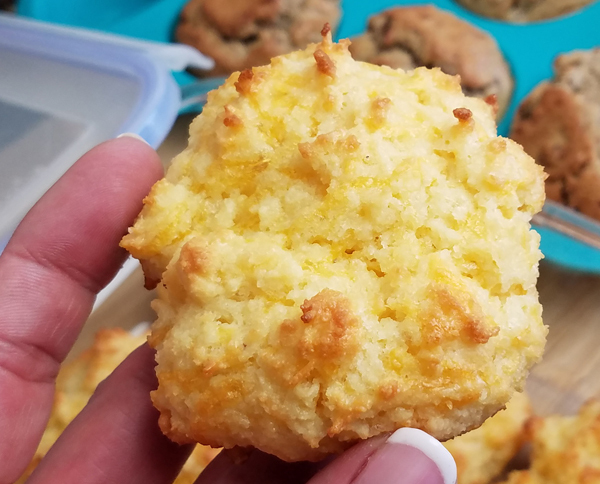 This time I added a cup of shredded cheddar to make Cheddar Drop Biscuits. 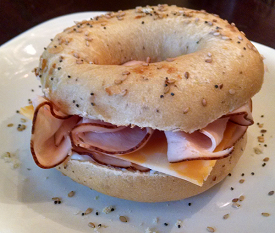 A bit more savory, and something I could easily grab & eat by itself or with a meal. I’ll share the recipe with you below. For breakfast I tried one of the muffins fresh out of the oven, and ate two of the cheddar drop biscuits. 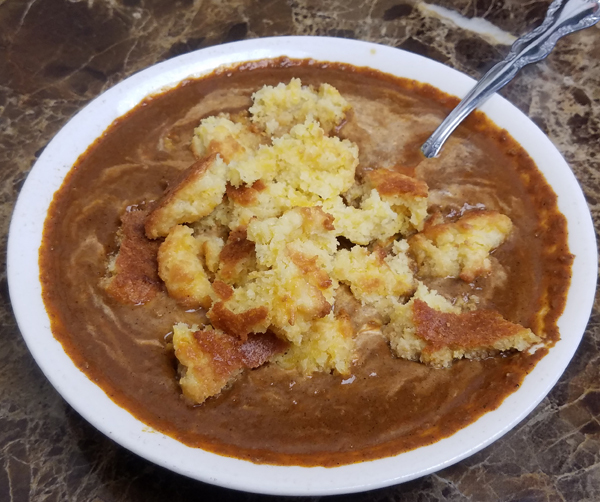 For lunch I decided to have the biscuits with a bowl of chili. My handy little Ozeri Kitchen Scale makes tracking macros SO easy! Sadly, I did NOT like this chili. I stirred in the cheese and sour cream and crumbled my cheddar biscuits in it even, to try to make it edible -lol. I couldn’t finish it. I did eat the biscuits and most of it at least, but I didn’t bother trying to subtract out the portion I didn’t eat in my food diary below. I was up late so when I got hungry again later I whipped up something YUMMY – just a bowl full of my favorite foods all together. Also, they just came out with pizza flavored seasoned almonds!! 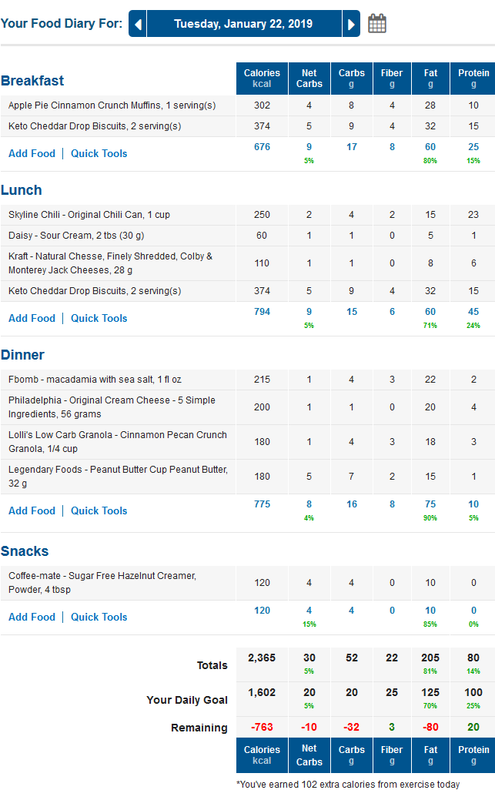 Here’s how my macros worked out for the day. Even if I had taken out what I didn’t finish of the chili, I did go over my usual 20 net carbs max/day goal by a bit. You’ll notice that Protein is only 14% of my total daily calories, yet I had 80 grams of protein. The recommended daily amount of protein for women is 46 grams a day. I’ve shared this recipe multiple times over the last couple of years in my collection of nut butter recipes and it’s also the same recipe I use to make keto waffles and pancakes. It’s a very versatile recipe! 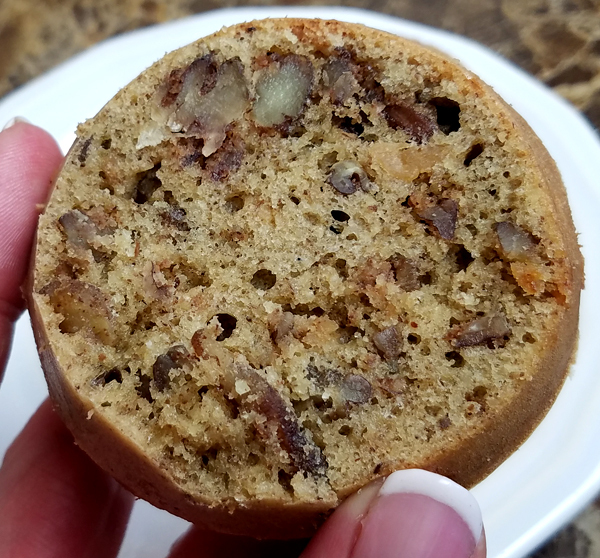 The “magic ingredient” to my keto muffin recipe is nut butters. 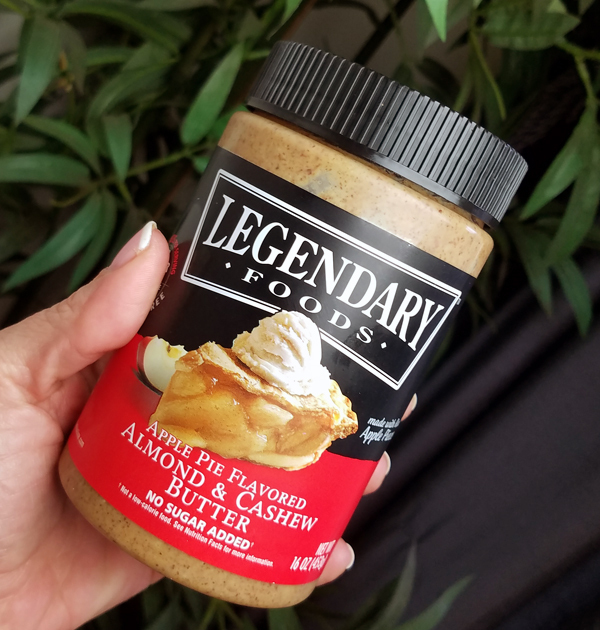 I especially love working with the Legendary Flavored Nut Butters because they are already… flavored! But I’ve baked with regular almond butter, Pili Nut Butter, even Macadamia nut butter would be great. For this recipe I used Keto Friendly Apple Pie Almond Cashew Butter. 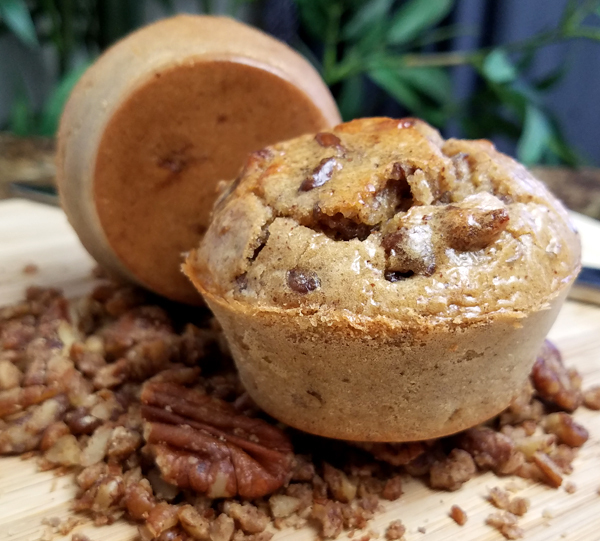 Between the Cinnamon Pecan granola and the Apple Pie nut butter, you can see just how much FLAVOR is packed into these keto muffins! 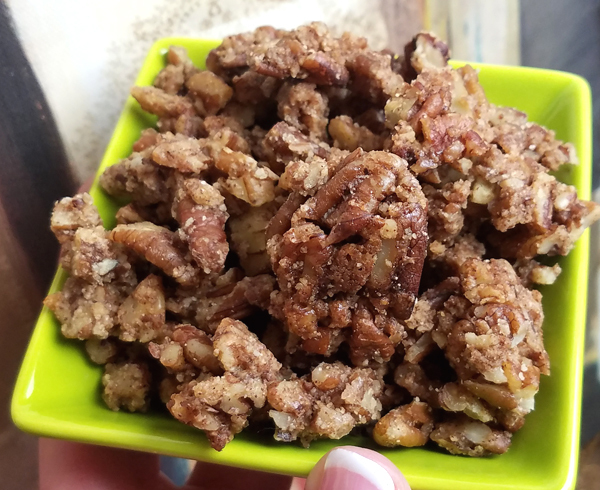 For this recipe I personally left out the sweetener and cinnamon, because the keto granola is sweetened and also has a cinnamon flavor – but it would have been even better with both added in. You can use any keto friendly nut butter and add in a variety of things like walnuts, keto chocolate chips or blueberries for example. * Note: I use Granular Swerve as the sweetener in this recipe because it measures the same as sugar and leaves NO aftertaste in my low carb recipes. If you use a different sweetener, you’ll want to use the equivalent to 1 TBSP of sugar. It helps if your eggs are not TOO cold, to prevent the melted butter or oil from clumping on you, and you definitely want your nut butter to be room temperature. I usually whisk my eggs first and set them aside on the counter while preparing everything else. Stir together the first three ingredients until smooth. Add the other ingredients. Mix well. If you’re adding in the Granola or nuts, I like to break them up/crush them a bit by hand or using a measuring cup, then simply fold them in at the end. Use a silicone muffin mold, grease a muffin tin liberally or line a muffin tin with muffin papers. Dip out a heaping 1/4 cup of batter for each muffin. Bake at 350 degrees until golden brown. Check after 10 minutes. Depending on the size of your muffins, they could take 10-18 minutes. They are done when a toothpick comes out clean. This was my first time using this silicone baking set I got on Amazon and I totally FELL IN LOVE with it! Without even oiling it, the muffins come out SO easy and so clean! The muffins turned out beautiful and delicious as usual! I used a heaping 1/3 cup and made 8 larger muffins this time, instead of the usual 10 (I think that’s what it usually makes). 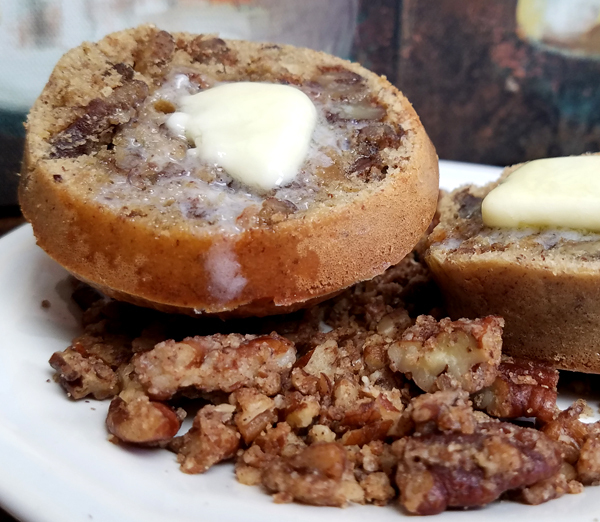 That plus adding in five full ounces of the Keto Granola – oh, and I added in an extra 2 TBSP of the Apple Pie Nut Butter too 🙂 – made my larger muffins come out to 4 net carbs each. Normally I make them smaller and use the normal amount of nut butter, but I wanted these extra-apply and HEARTY too. And at ~300 calories and A LOT of flavor these are filling enough to get me through breakfast hours with a pat of butter. If you make the muffins by my recipe outlined above yours will be lower in carbs, depending on what you use and what you add to them of course. 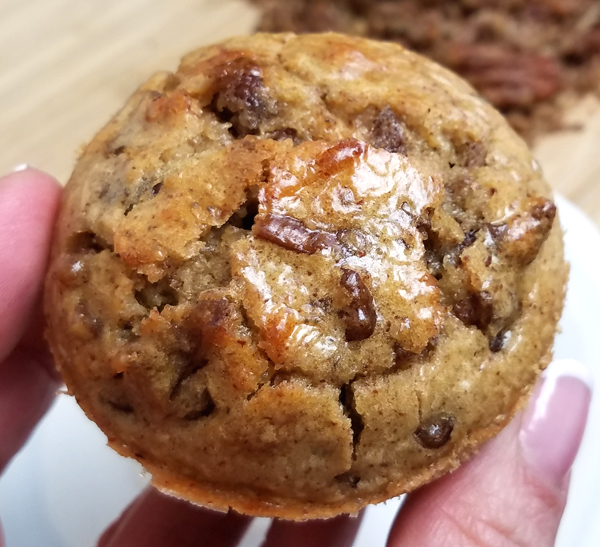 My Cinnamon Spice Keto Muffins were only 1.25 net carbs each, for example. I use the Free MyFitnessPal Recipe Calculator to enter in my ingredients based on my own labels and amounts, and the number of servings I make it into, which makes logging your portions super easy. Anyway, I hope this gives you some ideas to work with. Some people said they love the Skyline chili. I thought I would use it to make “chili cheese dogs” (sans bun) with my Oscar Mayer Smokies this week – but I really just didn’t like the flavor of it. Yeah, Cincinnati chili isn’t normal chili. I recommend just making your own. It’s easy. 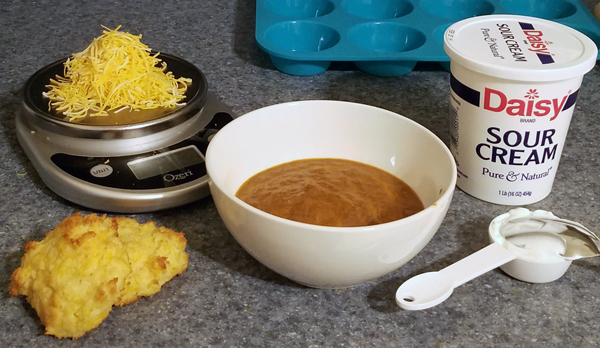 Skyline Chili is a Cincinnati specialty. It is traditionally eaten over spaghetti, or on a hot dog and garnished with shredded cheese and diced onion. It has a distinct blend of spices that make it very unique and if you’re not prepared for that, you will be surprised or disappointed. 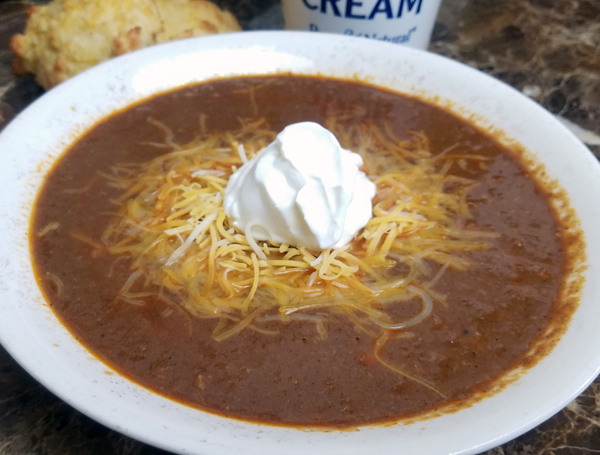 It’s definitely not your traditional “Texas” style Chili. It’s a whole different experience! How do you get your granola so fast? I’ve had mine ordered for several weeks now and still don’t have it. I keep getting a reply they are working on it, just wondered if it takes this long everytime you place an order. I wanted to make the muffins for super bowl Sunday, any other suggestions if I still don’t have my granola by then? I actually had this bag in the refrigerator for several weeks. I know she is working around the clock and has moved into a new kitchen to get orders baked and shipped faster. I can’t wait to hear what you think of it! For Super Bowl Sunday you can make all kinds of fun low carb foods! Party trays with meats, cheeses, nuts & berries, low carb dips and raw zucchini sticks, etc. Jalapeno poppers are really popular, you can do sausage balls, all the usual stuff – low carb style! I just received mine, it is well worth the wait. They were behind due to the overwhelming amount of orders. I wish there were coupon codes available as I definitely need more packages, lol. 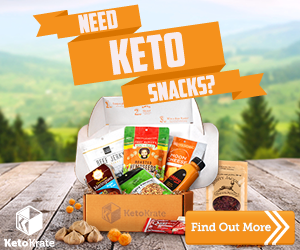 She has a discount coded into my affiliate link for you: http://lollislowcarbgranola.com/lowcarbtraveler so you’ll see the discount automatically at checkout when you use that link. If you order more than $60 worth there is a free shipping code at the top of the site, so you can switch back and forth to see which discount works out better for you. Skyline chili is Cincinnati style chili. You don’t just eat a bowl of it. It is served over spaghetti and topped with beans and onions and cheese for a 3, 4, or 5 way. Or over hot dogs. 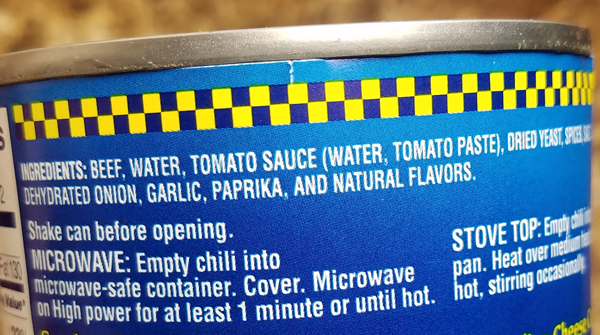 It is not regular chili to be eaten by the bowl. The texture is because you boil the ground beef, not brown it , so there are no chunks of beef. I always add an extra lb of ground beef to the canvas it is too soupy for me. I usually serve it over shiratake noodles and omit the beans. 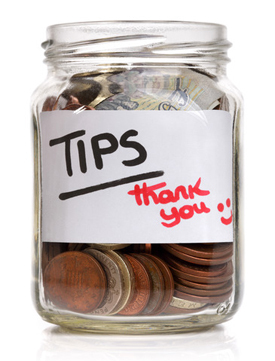 Good to know, Lisa – thank you for that info on it, and the tip to add more ground beef. A mix of ground beef and sausage would have probably been GREAT! 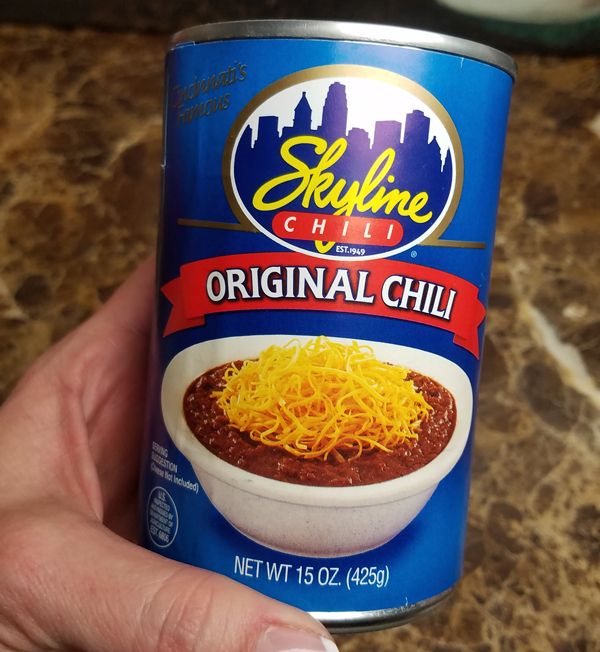 As an Ohioan, I LOVE Skyline chili #bornandraised Just last week, I had it the same way you did and ate every drop–though, I probably had more cheese. At the restaurant, they have a low-carb bowl where you eat it on hot dogs in a bowl with cheese (no buns) and it definitely fulfills a craving for me! 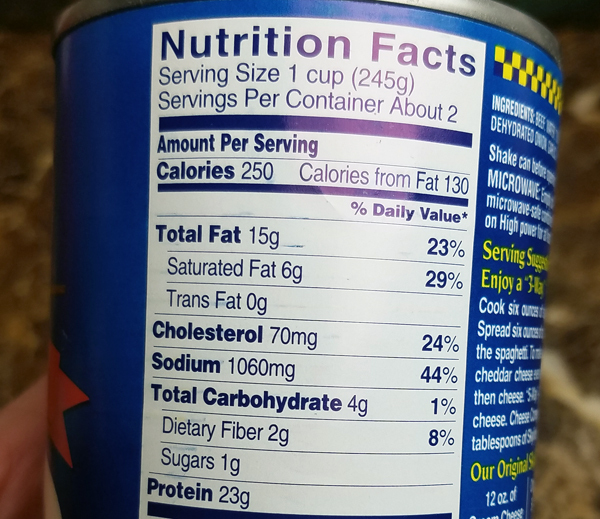 what is the nutritional value per serving? I’m especially interested in how many carbs, protein and calories each serving has. The nutrition value for what exactly – the muffins? I explained how I made mine different than the recipe, and you can see the macronutrients of a serving in my MyFitnessPal log there, and I also shared the link to the MFP free recipe calculator to get accurate macros / nutrition facts based on your own brands/amounts of each thing you use in any recipe. Lynn, is there a current “coupon” for the Lolli granola? Did I miss it? Yes! 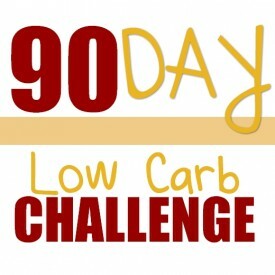 She has a discount coded into my affiliate link for you: http://lollislowcarbgranola.com/lowcarbtraveler so you’ll see the discount automatically at checkout when you use that link. I made the muffins the same way you did in your original recipe (without the granola so they would be lower carb). Then I changed the way I served them. I allowed myself 2 original muffins. I reheated the muffins by toasting them slightly in my air fryer and I took 1 tsp of the apple pie nut butter and 1 tsp of cream cheese and blended it together. I sliced across my muffins, put the spread between the slices like a filling and it was sooooo good.